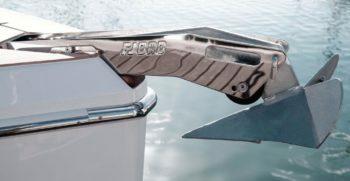 Fjord 36’ Open, the smallest of the Fjord fleet was first presented in 2011. 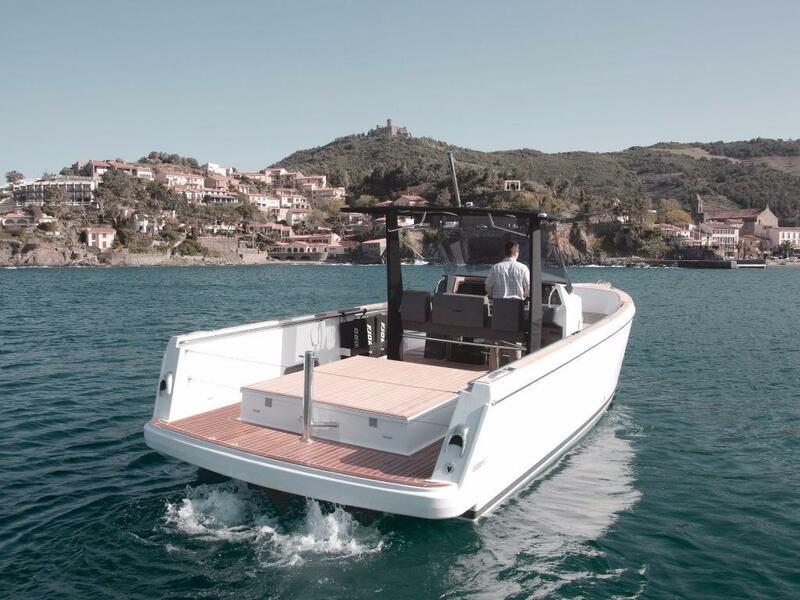 This was the second model to be launched by the famous Shipyard after the success of the Fjord 40’ Open. 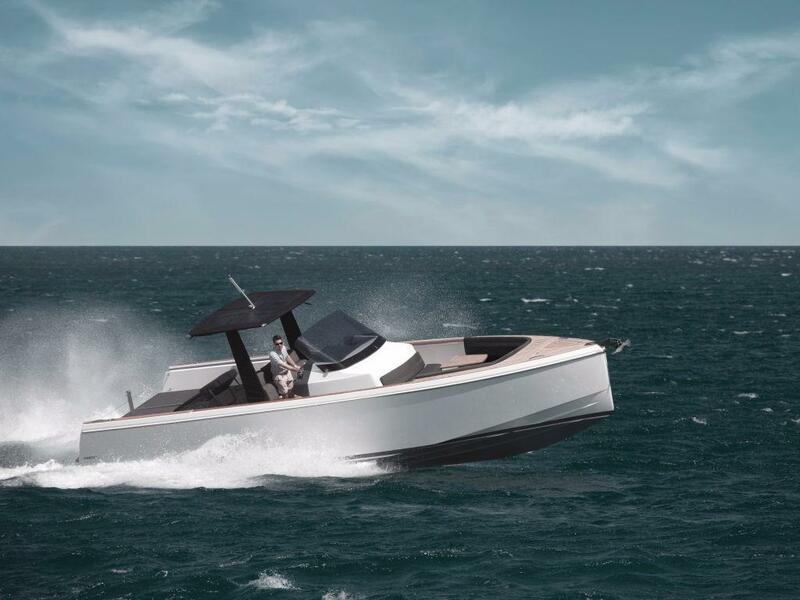 This barely 11meter vessel is the proof that Hanse once again designed a brilliant hull in collaboration with the Patrick Banfield design studio. 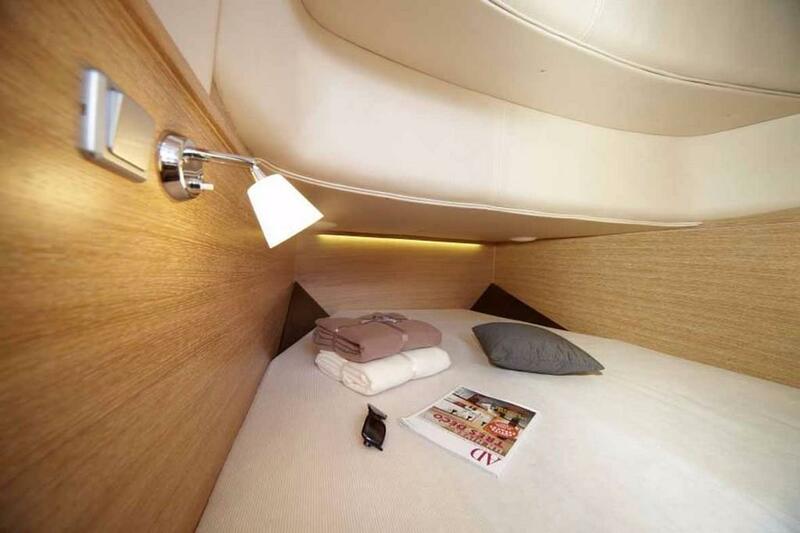 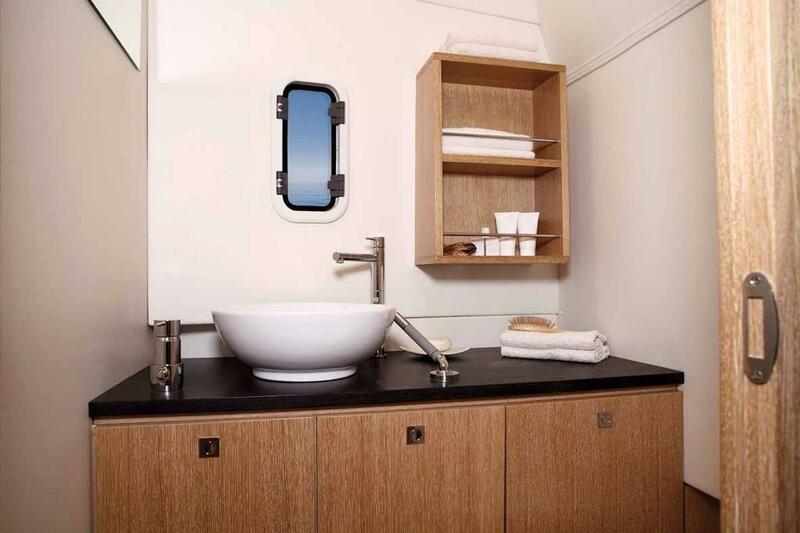 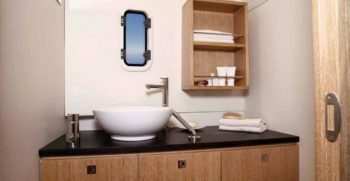 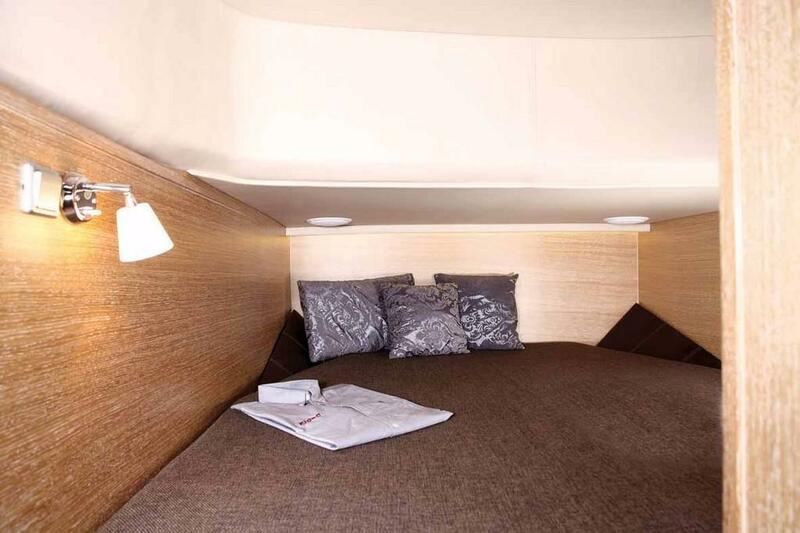 The cabin dimensions were reduced but still kept the independent bathroom and generous spaces on deck. 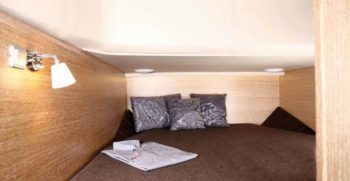 Yet again Fjord concentrates on the outer space on the main deck. 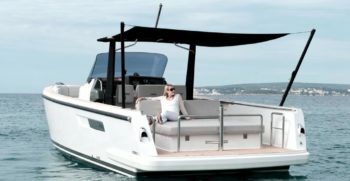 The comfortable and safe walk around communicates the bow and stern seating areas with a flush hand rail fitted under the bulwark. 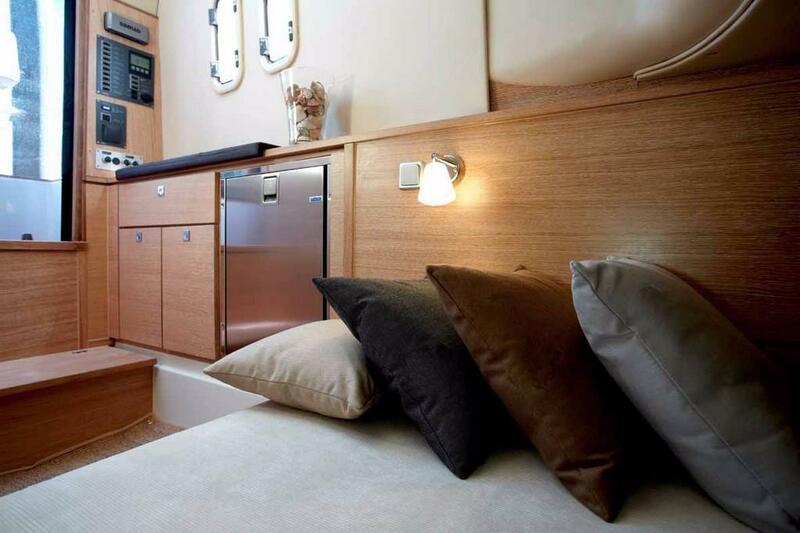 On the Fjord 36’ Open the dining area is in the bow, offering seating to 6 guests around the table. 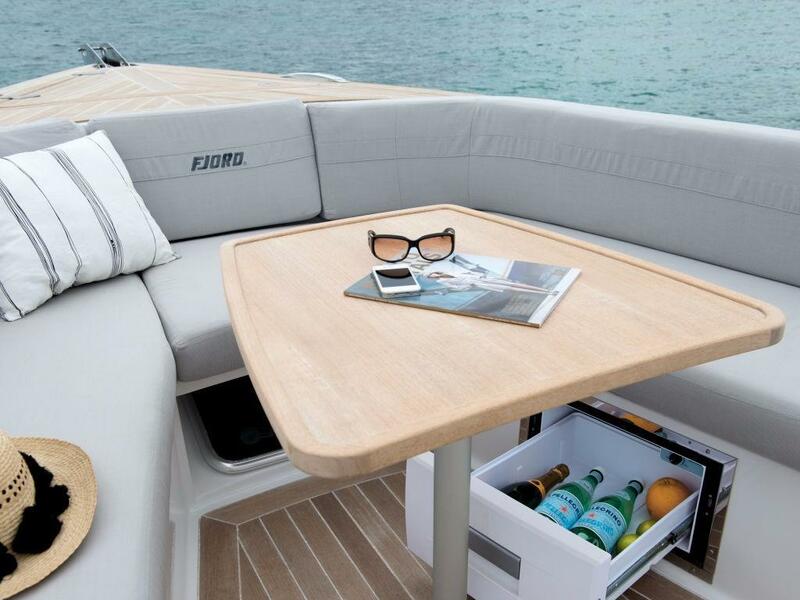 This same table and seating can be quickly converted into a second sunbed. 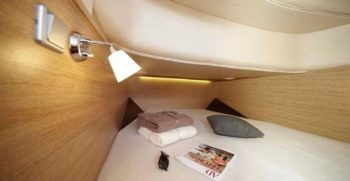 The main sunbed is in the cockpit aft. 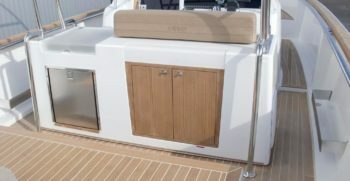 The head supports of the rear sunbed can be re positioned so as to form the backrest of a forward facing seat for four. 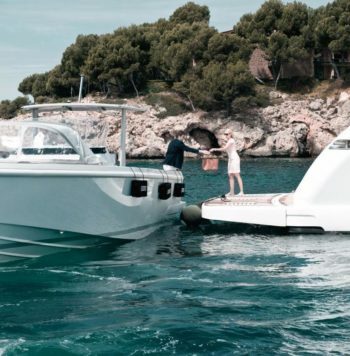 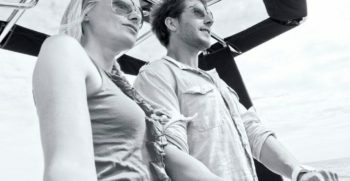 Access to and from the extra-large bathing platform is limited by the stainless steel gates which give extra security if you have children on board the boat. 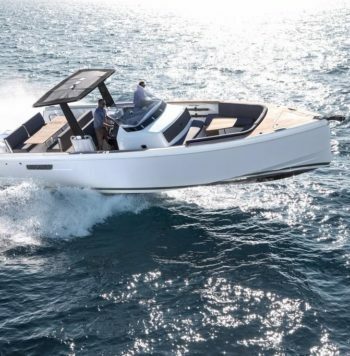 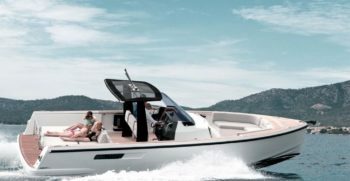 The yacht Fjord 36’ Open injects dynamism and performance into the Fjord fleet, with two in board engine options, 260Hp and 300Hp both with Volvo DPS transmission. 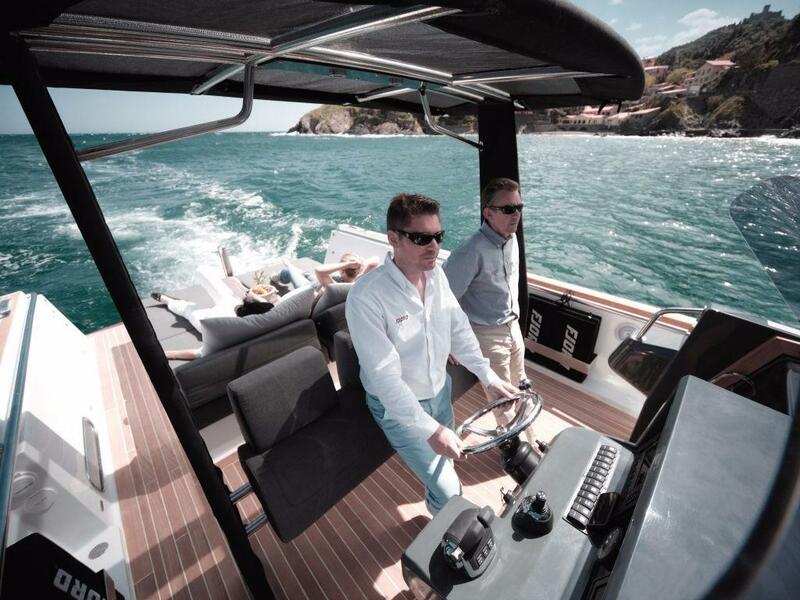 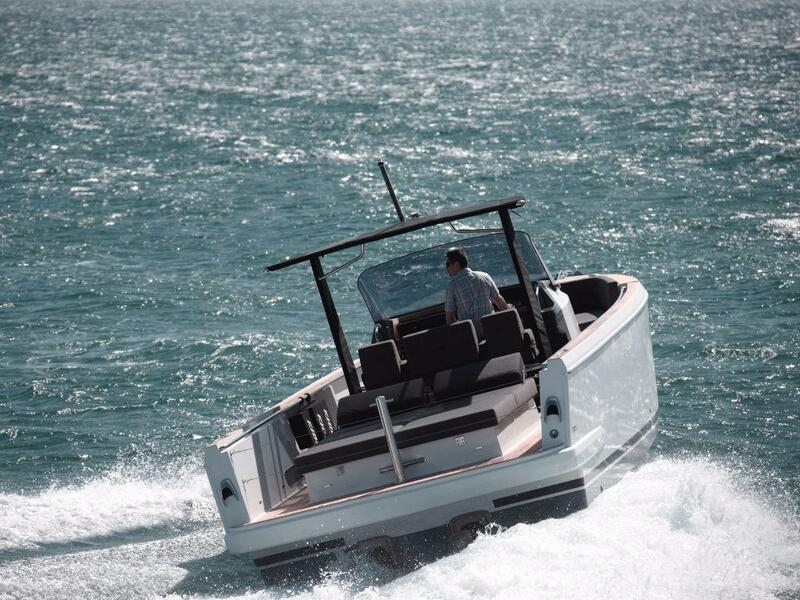 A light displacement and carefully designed hull allows for a top speed of 40 Kts and a cruising speed of 30 knots. 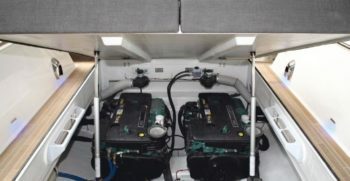 The consumption is a mere 60 liters per hour combined, allowing for a range of 300 miles. 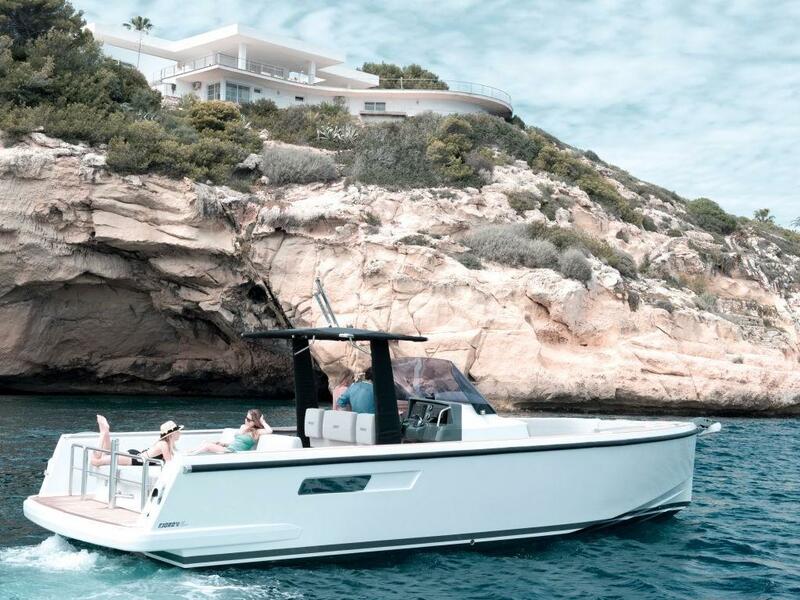 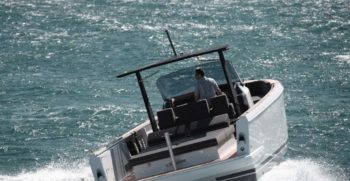 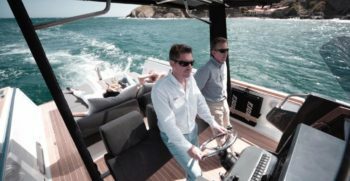 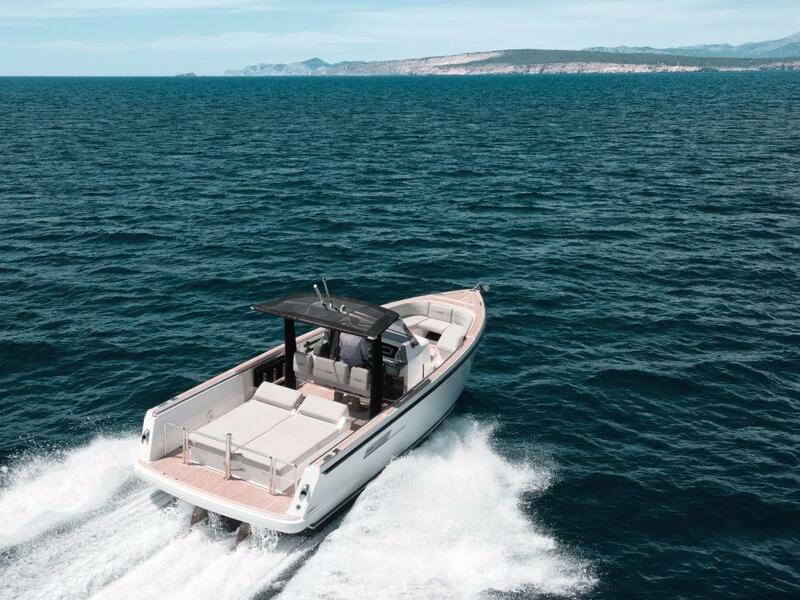 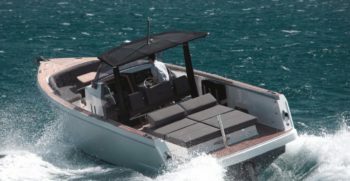 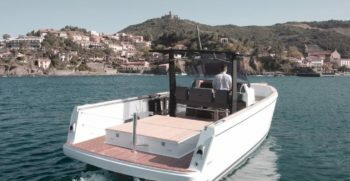 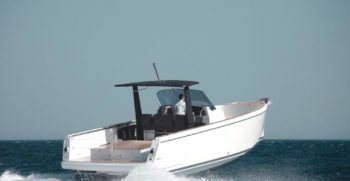 What at first seemed a vessel destined to coastal navigation has converted into an all-rounder perfect for island hopping or even as a chase tender for Mega Yachts. 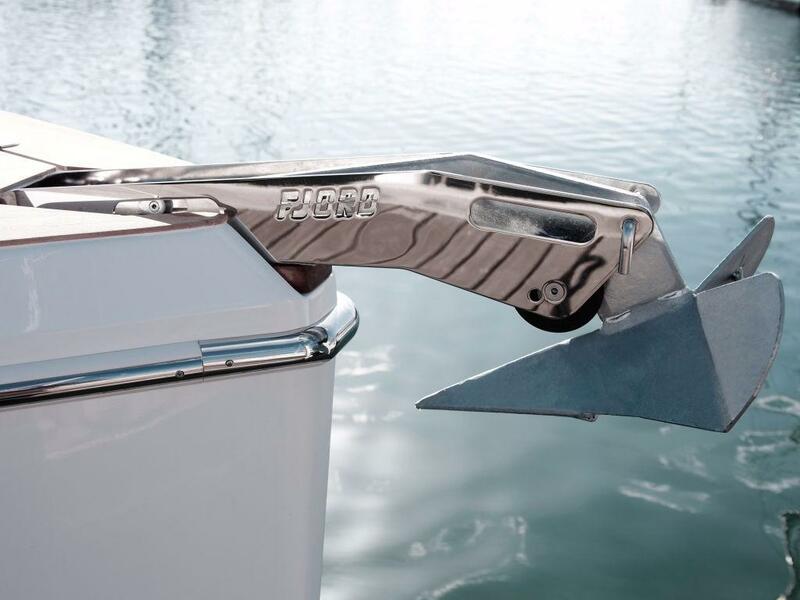 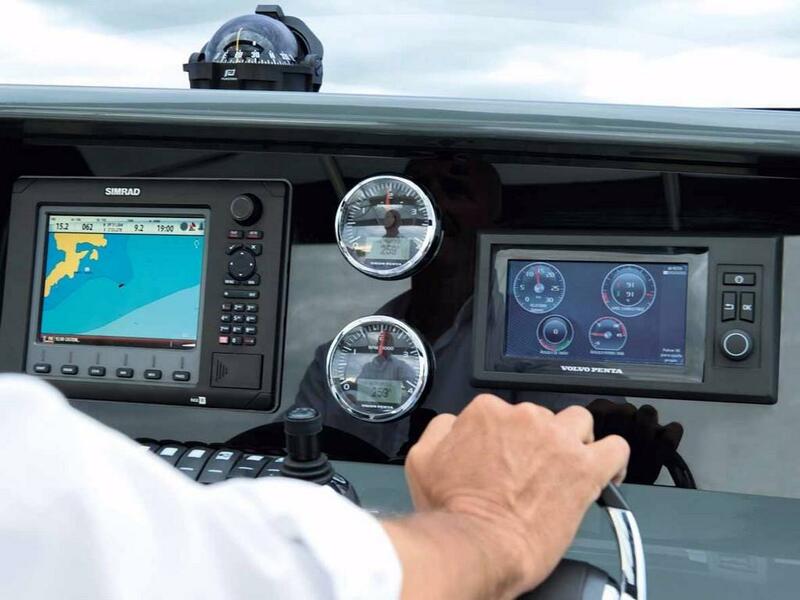 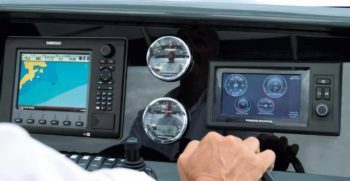 The Joystick which is a standard feature in this model offers intuitive and safe handling when maneuvering in the port. 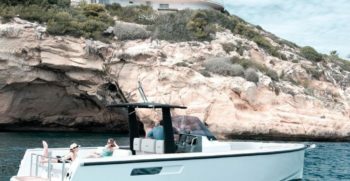 There is no excuse anymore not to go out to a nearby “cala” even on your own. 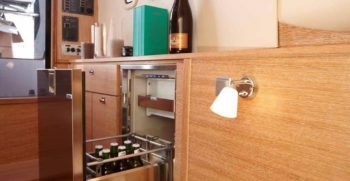 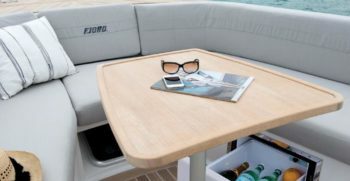 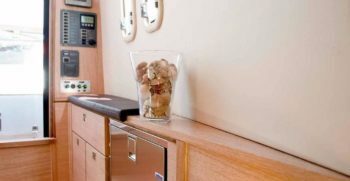 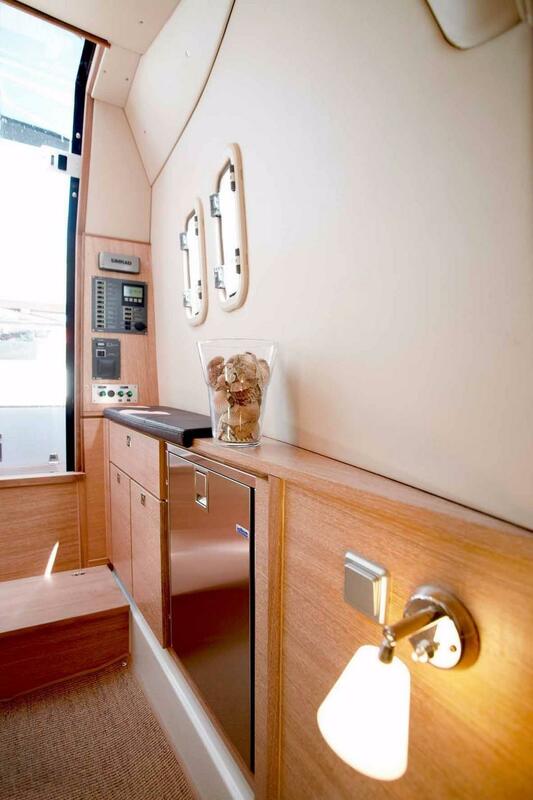 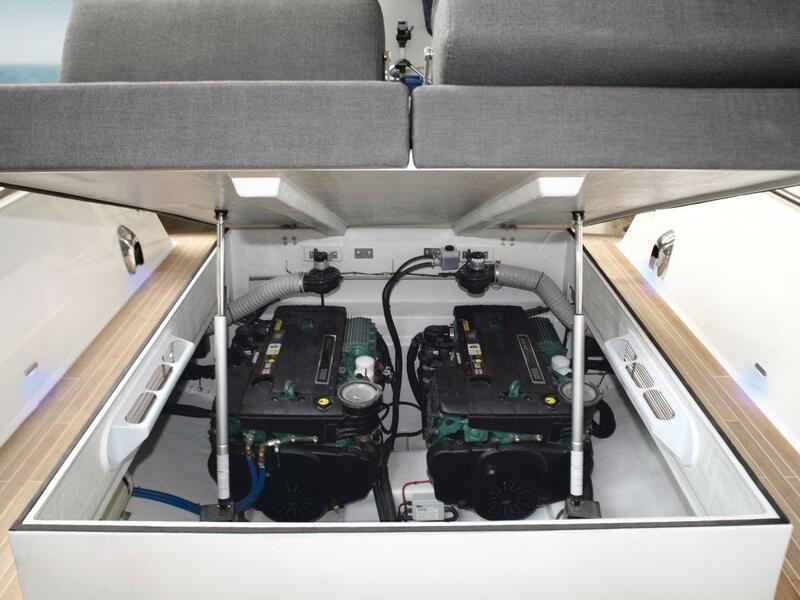 The Fjord 36’ Open has a Galley Option which includes a fridge, sink and a gas hob with two burners and some storage space behind the helm seats. 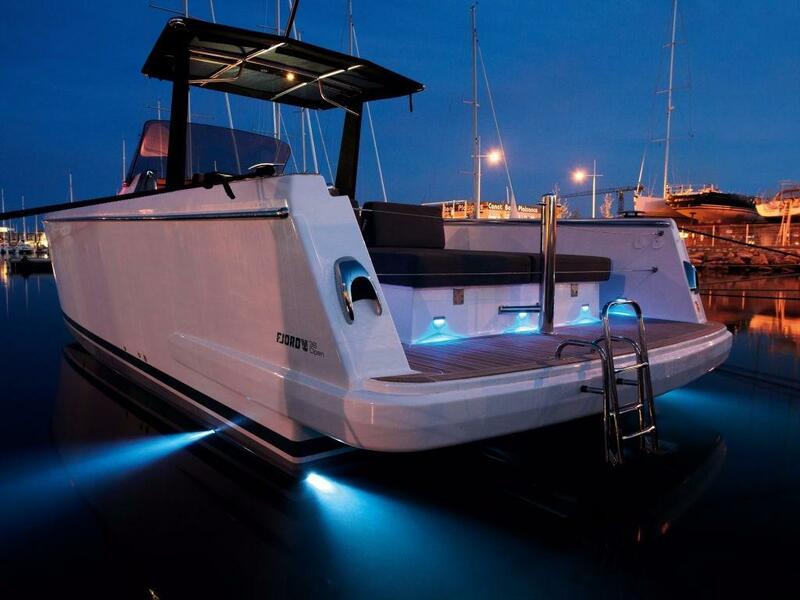 This allows you to stay out in style if you are captured by the magic of a beautiful sunset. 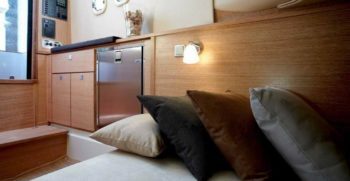 This boat has a double berth in the Cabin and independent Bathroom that offers comfortable accommodation for short trips. 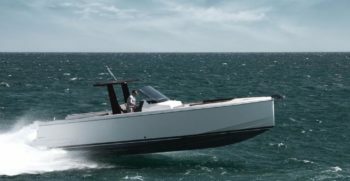 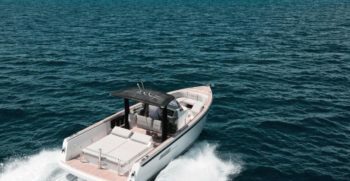 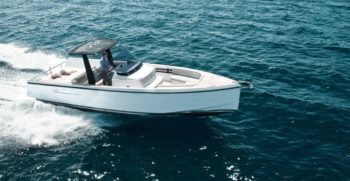 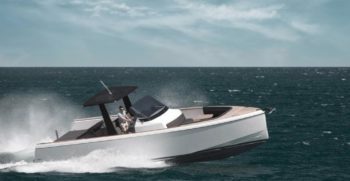 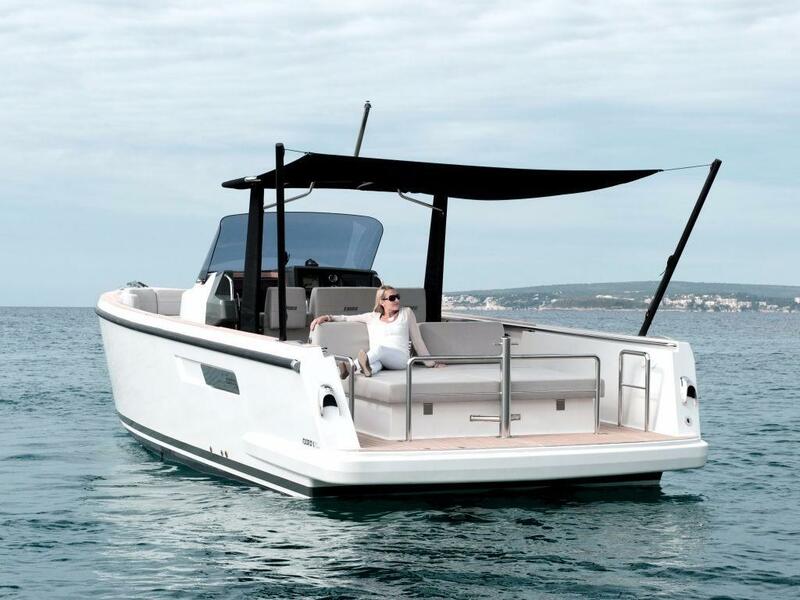 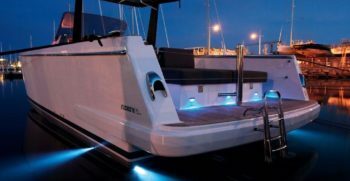 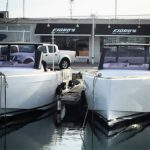 The complete Fjord fleet has been designed for safety, comfort, space, sea worthiness and style the Fjord 36’ Open is no exception to the rule. 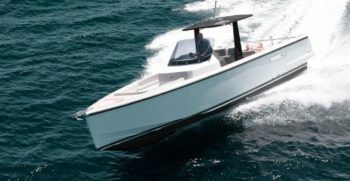 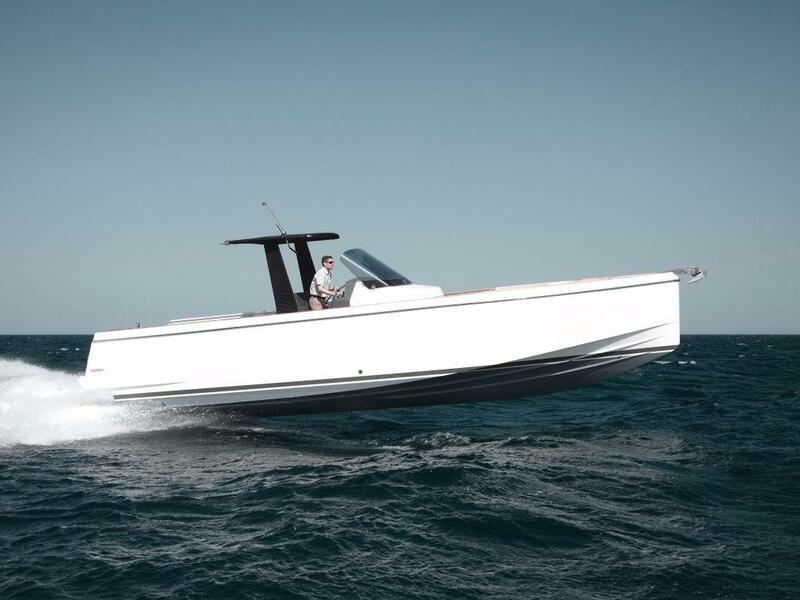 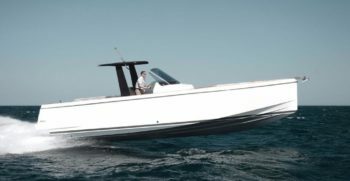 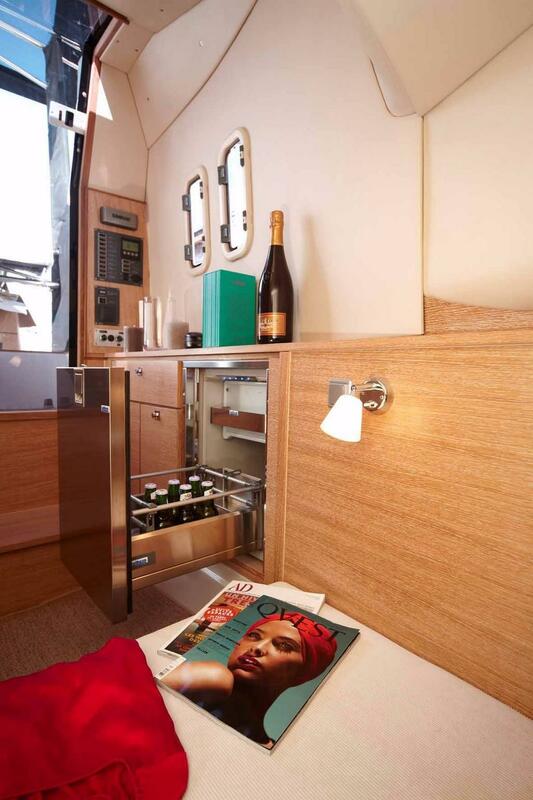 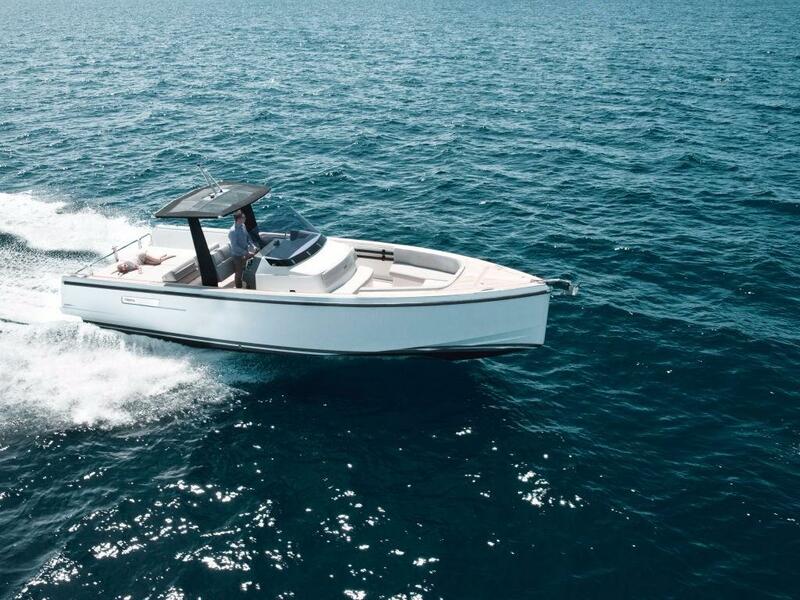 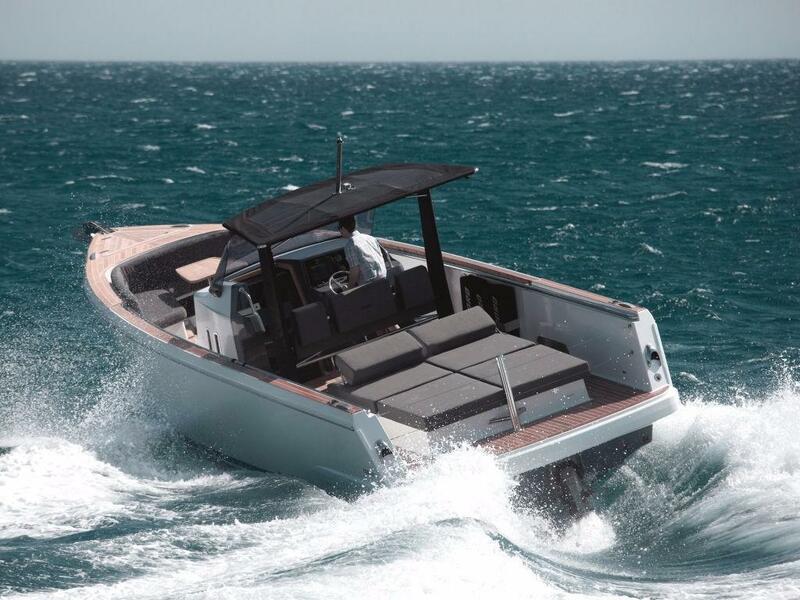 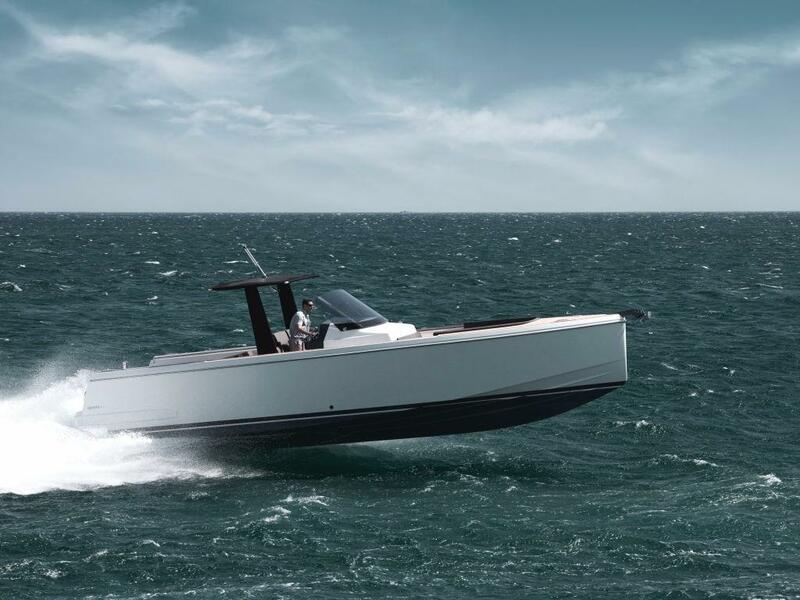 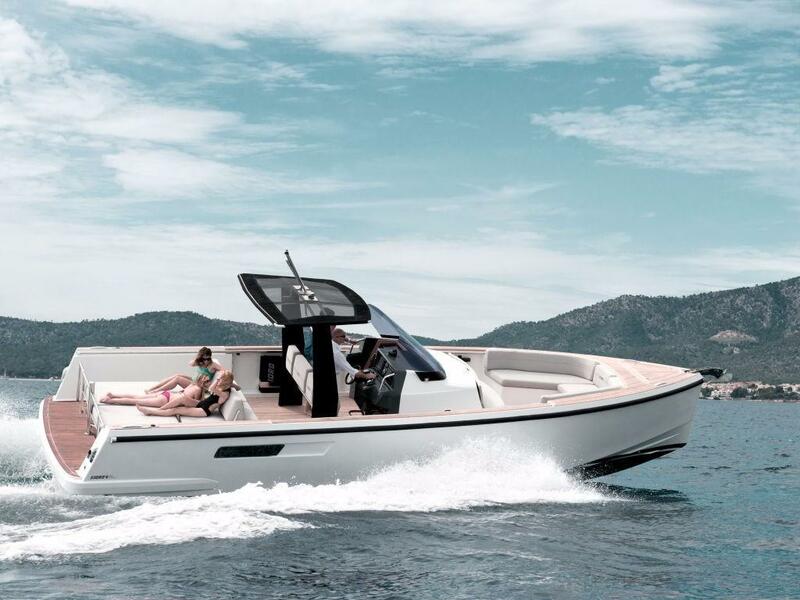 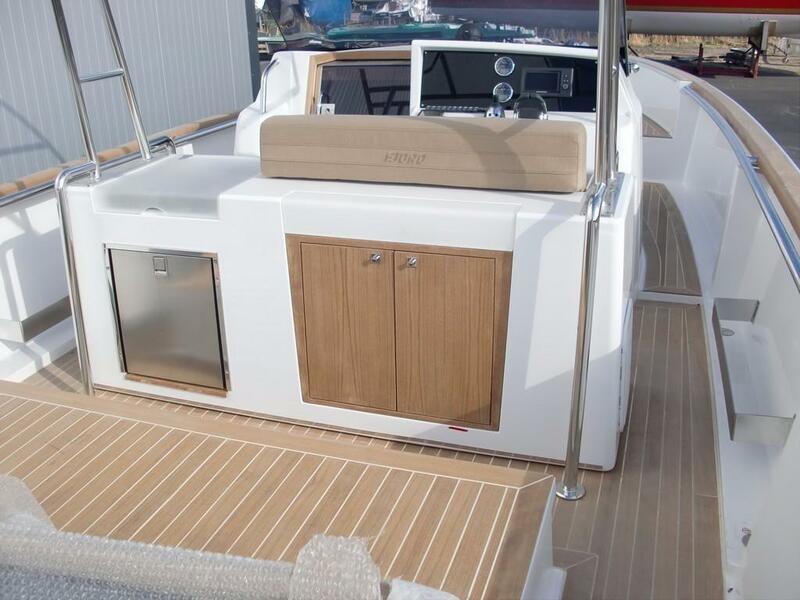 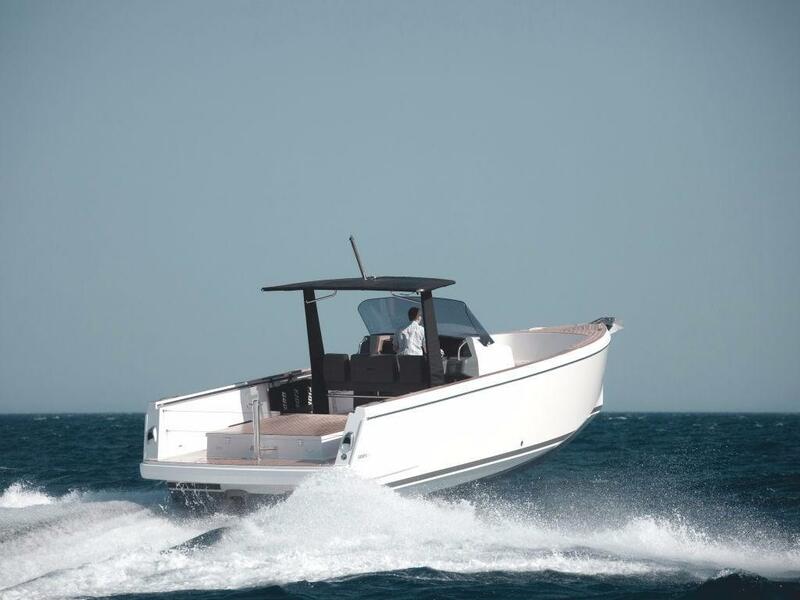 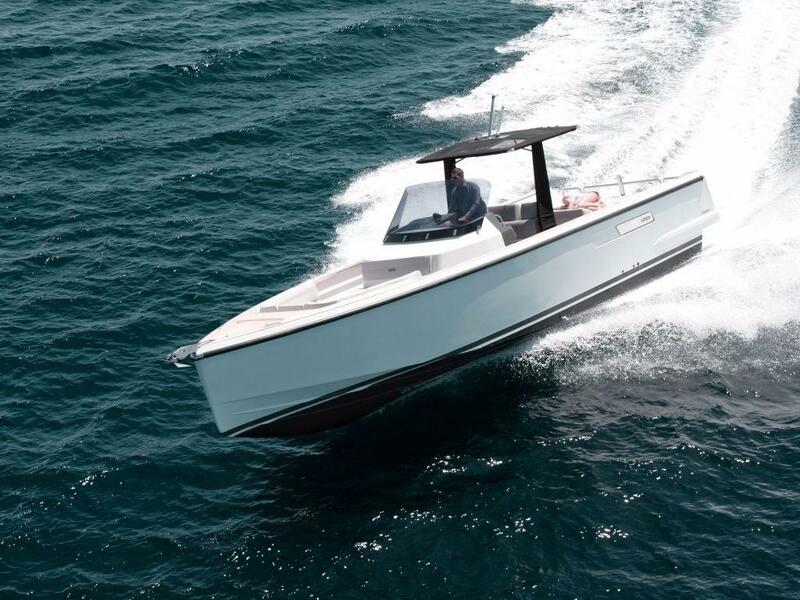 The 36’ Open attracts attention due to its clean lines and characteristic T-Top. 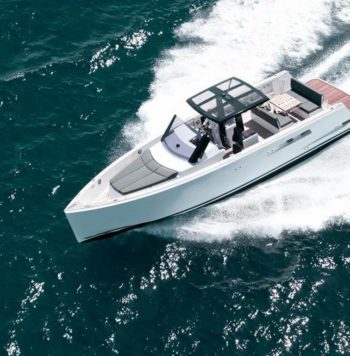 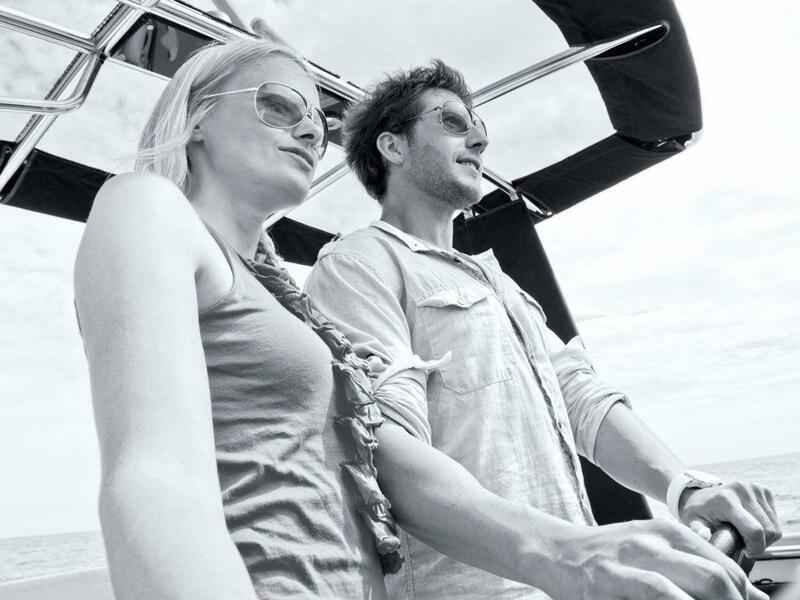 Fast and fuel efficient, easy to handle and spacious this yacht is any captain’s dream.